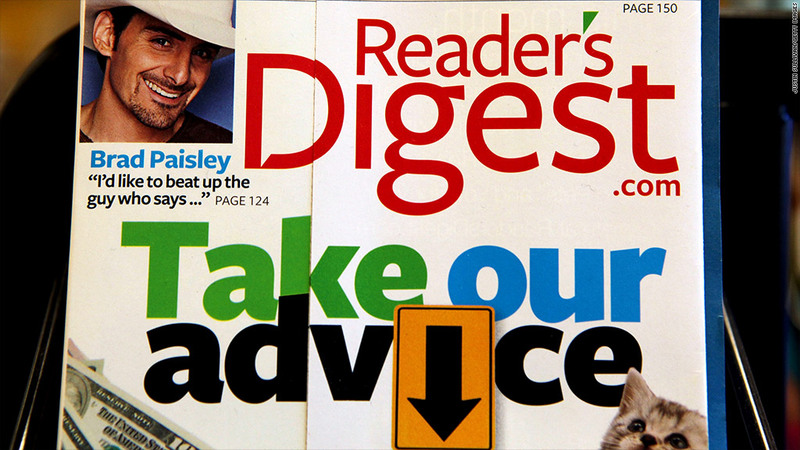 The parent company of Reader's Digest magazine, RDA Holding Co., filed for bankruptcy Monday as part of a financial restructuring move that includes shrinking its $465 million debt. This is the second time in four years that the iconic print magazine has faced bankruptcy. In 2009, its then debt-laden publisher Reader's Digest Association Inc., also filed for bankruptcy. In 2010, the company emerged from bankruptcy after being taken over by its lenders. "After considering a wide range of alternatives, we believe this course of action will most effectively enable us to maintain our momentum in transforming the business and allow us to capitalize on the growing strength and presence of our outstanding brands and products," RDA Holding CEO Robert Guth said in a statement. RDA expects to exit bankruptcy with just $100 million of debt, or about 80% less than the current level. The 91-year-old magazine, founded by DeWitt and Lila Wallace, was once among the nation's best-selling magazines. But it has become the latest longstanding title to fall on hard times as consumers increasingly favor reading content digitally -- on tablets and smartphones -- to the traditional paper format. The Pew Research Center said in September that just 18% of Americans surveyed reported having read a magazine in print the previous day, down from 26% in 2000. Some 39% reported reading the news online. Last month, magazine publisher Time Inc., a division of CNNMoney.com parent company Time Warner (TWX), said it would to cut 6% of its staff of 8,000, or roughly 480 people, as it attempts to "continue to transform [the] company into one that is leaner, more nimble and more innately multi-platform." Fortune reported last week that Time Warner was in talks with Meredith Corp. (MDP) to separate itself from Time Inc., possibly yielding such publications as People and InStyle to the Des Moines-based publisher of Family Circle. Newsweek, Time's historic rival, ceased publication of its print edition at the end of last year. Editor-in-chief Tina Brown said the growing use of tablets, combined with weakness in print advertising, drove the decision. Magazine publisher Condé Nast also reportedly began a round of job cuts late last year. RDA Holding's Chapter 11 bankruptcy protection documents were filed in the U.S. Bankruptcy Court for the Southern District of New York. RDA said its expects the bankruptcy proceedings to conclude in less than six months, subject to court approval. The company said it would continue to publish all of its U.S. publications during that period.